For a long time scientists and artists have been interested in the lived urban experience and how the urban environment exerts influence on the emotions, behaviours and wellbeing of people. The methods of investigation have ranged from poetry and visual arts to psychological experiments and epidemiological studies, all of which have aimed to understand how people experience their environment and, often, how it influences their health and wellbeing. The focus of my MRes dissertation at the Centre for Advanced Spatial Analysis (the Bartlett, UCL) was the role of urban ambient sound in how people feel and behave, and whether choosing to navigate a city through quiet and peaceful areas could help to reduce their experience of stress, or even to enhance their mood. The relationship between sound levels (dBA) and emotional states was explored with innovative data to gain new insights into how people feel in urban environments. The study was inspired by Yahoo Labs’ Happy Maps algorithm, which aims to recommend beautiful and mood enhancing routes through a city, instead of the shortest path. The study data consisted of brain oscillation data collected with a mobile EEG headset Emotiv Epoc, sound level data collected with SoundMeter iPhone application, GPS data collected with a smartphone application, and experiment participants’ own evaluations of the routes. The EEG data was ‘translated’ by Emotiv’s Affective Suite software into four emotional states: Excitement, engagement, frustration and meditation. Do sound levels and emotions interact? The streets in the graph are in the order of the walk, starting with Euston Road (left) and finishing at Gordon Street (right). Emotion level measurements are from 0 to 1 and sound level measurements are from 72 to 76 dBA. The scale of the investigation was very local and the methodology was experimental, but it was possible to detect evidence of street characteristics that made a street more pleasant and less stressful. The walk through Central London streets was designed so that one route from Euston Road to Soho Square was supposed to be busy, loud and unpleasant, and another route from Soho Square to Gordon Street was supposed to be peaceful, quiet and pleasant. The walk started and finished at the UCL Student Union building. Streets on the busy route were expected to have higher sound, frustration, engagement and excitement levels and lower meditation levels than the less busy route. The busy route was found to have a slightly higher sound and frustration levels and lower meditation levels than the more peaceful route, but the excitement and engagement levels were also lower for the busy route which did not follow what the restoration theory proposes (see e.g. Herzog, Black, Fountaine and Knotts, 1997). However, the differences in the routes’ sound and frustration levels displayed the expected trend, which was confirmed by the experiment participants, who reported finding the busy route more stressful, less pleasant and acoustically less comfortable than the route that was more peaceful. Parallel busy and peaceful streets were compared to establish whether choosing one street over the other one could have an effect on one’s mood. The sound levels at two of the street segment pairs – Torrington Place and Byng Place, and Gower Street and Gordon Square – had statistically significant differences and they also showed noticeable differences in frustration levels. 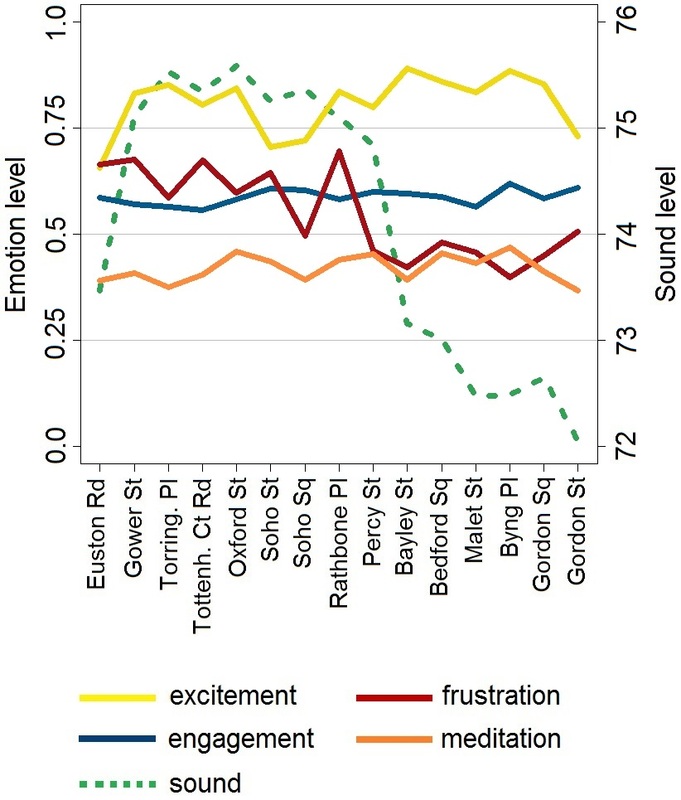 The experiment participants’ emotional responses and the measured sound levels were most contrasting on these street segments, and based on this evidence one could come to the conclusion that choosing the more peaceful and quieter over the busier streets may improve a person’s mood and lessen their experience of stress. The frustration and sound level trends displayed a subtle but consistent interaction. The sound levels that were measured during the experiments were higher than the day time sound levels modelled by DEFRA in 2008, and they were also found to be higher than a normal conversation volume. This implies that the ambient sound environment in Central London could be a hindrance to communication and a factor in stress. Rathbone Place. Peaked frustration levels circled. One of the most interesting locations on the experiment walk was Rathbone Place, which turned out to be the most stressful i.e. where the experiment participants had the highest frustration levels (see the graph above and the map to the right) and where sound levels were also surprisingly high. Rathbone Place was originally thought to be a peaceful street that should have been less stressful than e.g. Oxford Street. 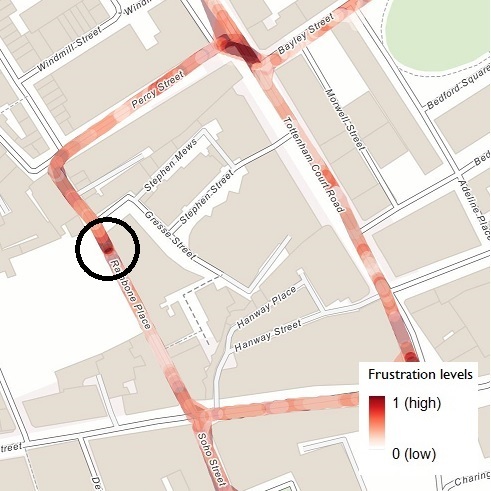 Junctions are known to be stressful for pedestrians, hence they also light up in the mapped frustration level data, but Rathbone Place was a surprise as there was nothing obvious about the road infrastructure that would be a source for frustration. 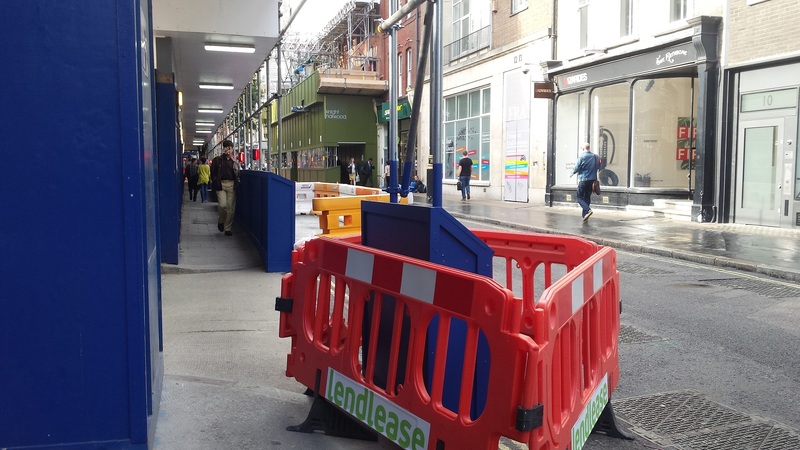 However, a brief investigation of the location revealed a busy construction site at Rathbone Place with obstructions on the pavement, all pedestrian traffic being channelled through narrow walkways (see photo below) and typical construction site sounds. I did not have recollection of the building site, probably because I only did a couple of the data collection walks (Pablo from the Smart Cities MSc did most of them while I was still working full time), so it was reassuring to identify purely from the data that this was a very stressful location for the experiment participants. We know now that the EEG data can be used to detect location specific emotions, but the interpretation of what it means is up to the researcher. It could be an interesting way to conduct an assessment of a place, such as a street, neighbourhood or even just a building. Pedestrian traffic channelled through walkways at Rathbone Place. I only had four full datasets of the EEG and sound level data, so unfortunately it was not possible to e.g. test for correlations. However, sound and frustration levels showed subtle interaction i.e. when sound levels went up, frustration levels also went up, although quite likely a busy location is also a loud location, so loud sound is not a simple causal explanation for high frustration levels. The relationship between sound and frustration levels was not statistically significant, but this may be due to the small sample size. With a larger dataset it would be possible to achieve more (statistically) reliable results. The experiment participants consistently evaluated the peaceful route as generally more pleasant and acoustically more comfortable than the busy route. A combination of objective measurements and subjective evaluations was ideal, especially with the focus of the research being on how people feel. A further investigation could include a visual record of the walked route, coupled with sound recording for the meaning and frequencies of the sound and experiment participants’ tracked eye movements in combination with the EEG and GPS data. This would make an even richer dataset with exciting possibilities for the analysis of emotional responses to the urban sensory environment. 02/09/2015 in Data, Dissertation, Wellbeing. Are quiet routes ‘happier’ than noisy routes in a city? ← Are quiet routes ‘happier’ than noisy routes in a city?